Irene Rodríguez and Noè Rodrigo form Mbira-duo, a percussion duo created in 2014. Their members, from Ribadeo (Lugo) and Altea (Alicante), met at the Conservatorio Superior de Música de Aragón (CSMA), where they started this project together. 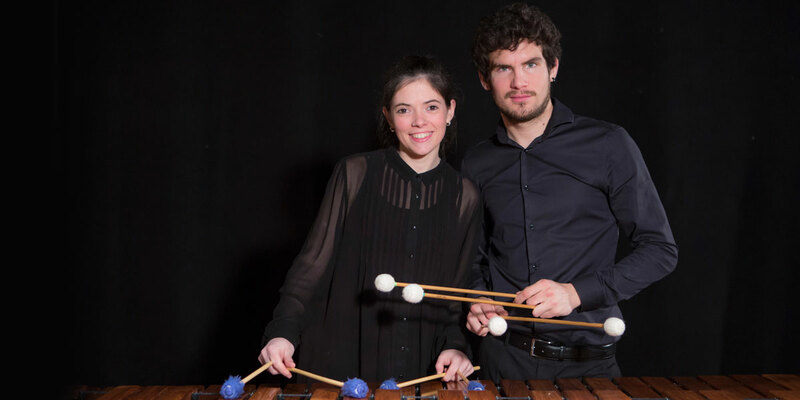 After their graduation in 2014, they both continued their studies at the Conservatorium van Amsterdam (CvA) to further develop their musical careers both in soloist and orchestral percussion, as well as in percussion duo. Orquesta Xoven da Sinfónica de Galicia (OJSG); and international: Schleswig Holstein Musik Festival (SHMF), European Union Youth Orchestra (EUYO), Lucerne Festival Academy Orchestra, Gustav Mahler Jugend Orchester (GMJO), Nederlands Jugend Orkest (NJO), Penderecki musik:akademie Westfalen and Symphony Orchestra Academy of the Pacific (SOAP), in Canadá. As a duo, Mbira has participated in the concert serie Música al So de l’aigua in Altea (Alicante), as well as in the project Combatir el fracaso escolar con la Música (fighting school failure through music), in the concert serie Músicas Posíbeis in Ribadeo and in the IX Ciclo de Música y Patrimonio de Ejulve (Teruel). Mbira-duo offered concerts in the Teatro El Albéitar from León, Conservatorio Profesional de Música de Lugo, among others. They have given masterclasses at the Escola Municipal de Música de Ribadeo, Conservatorio Profesional de Música de Lugo and have taken part of the faculty teachers of the summer camp Merza Percusión in 2017 and 2018. They have also participated in the festivals: Minimal Music Festival, in Amsterdam, II Festival de Música Contemporánea de Ponferrada, Festival Internacional de Música de Navas de San Juan (Jaén), Festival Internacional de Percusión de Galicia (FIP Galicia), in the FIP Zaragoza and offered two concerts in the concert serie Marcos Históricos, from the Festival Internacional de Música de Santander 2018.